Happy day bookworms! I hope everyone is having a productive Tuesday! 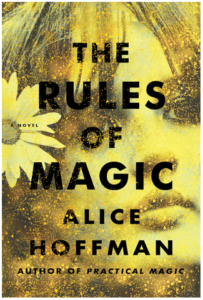 This past Friday, I finished up reading, The Rules of Magic by the infinitely talented, Alice Hoffman. As with many books that I fall completely in love with, it takes me a while before I am able to sit down and put my thoughts of a book down in words. This book is no exception to that! I borrowed The Rules of Magic from a friend – after I lent her my copy of Practical Magic she went right out and bought and read Rules. I knew from her raving about it that it was equal in stature to PM. The Rules of Magic, the prequel book to Hoffman’s super successful, Practical Magic, leads readers through a coming of age tale starring everyone’s favorite Aunts: Jet & Franny Owens. Unbeknownst to me, they also have a brother, Vincent, who is equally vibrant and naughty. Starting very early, this lyrical book weaves together so many different aspects of the Owens history and lives that pieces of Practical Magic start to fit a little better into place. Hoffman’s style is flowing and beautiful, you cannot help but be swept up into the story. I cried, I laughed and I left a bit of me behind as I closed the final page but I also took something with me: hope & love – that’s what a story should do to us. I would give this book all the stars if I could – it certainly deserves it! If you are curious about Practical Magic as well, I finished it last October and wrote the following thoughts upon completion: I absolutely adored this- read it in a weekend. The writing is beautiful. It is quite different from the movie version but stands really strong in its own right. I did picture Sandra Bullock and Nicole Kidman in my head though the whole time I was reading it- which really made it come alive. If you haven’t read this, you should! Have any of you read these books? or any of Alice Hoffman’s writing? I would definitely like to read more of her books – if they are anywhere near as captivating as these two, I know I will love them!